DVDFab Blu-ray 3D Ripper is definitely the first software in the world which can independently convert Blu-ray 3D to 3D video files like AVI, MP4, WMV, MKV for playback on 3D display device. Especially, it supports the current popular side-by-side format. The 3D type can be left/right or top/bottom. And with its outstanding speed, quality and robust functions, you must be happy. 1. Blu-ray 3D Ripper helps you remove all known AACS copy protections, BD+ copy protections including newest 3D BD+, region code, BD-Live, UOPs, MKB V25, so any Blu-ray 3D content can be accessed. 2. Blu-ray 3D content can be ripped to various video files like AVI, MP4, WMV, and MKV, still with 3D effect retained. 3. The output 3D video can be played using certain software player like Stereoscopic Player and NVIDIA 3D Vision Video Player, and can also be transferred to 3D display or 3D TV for playback. 4. Blu-ray 3D Ripper supports side-by-side 3D format -- a popular format for 3D content's transmission, which has been already used by some cable TV providers. 5. The 3D type is usually in left/right format, but for some devices, it is required to be top/bottom. Take this into consideration, Blu-ray 3D Ripper supports both left/right and top/bottom for the output. 6. The video frame size can be 100%, or if you desire for a higher coding speed, you can use 50% for normal output picture size while still enjoy fantastic viewing experience with negligible loss. 7. The original Blu-ray 3D in 1080p can be output just in the same definition, or converted to 720p video, the choice is yours. 8. Blu-ray 3D Ripper completely supports H.264 MVC standard, and the included decoder is specially offered by DVDFab. A convenience for users! 9. You are capable of editing and customizing with absolute freedom, and happy to use with fast speed and many conveniences. 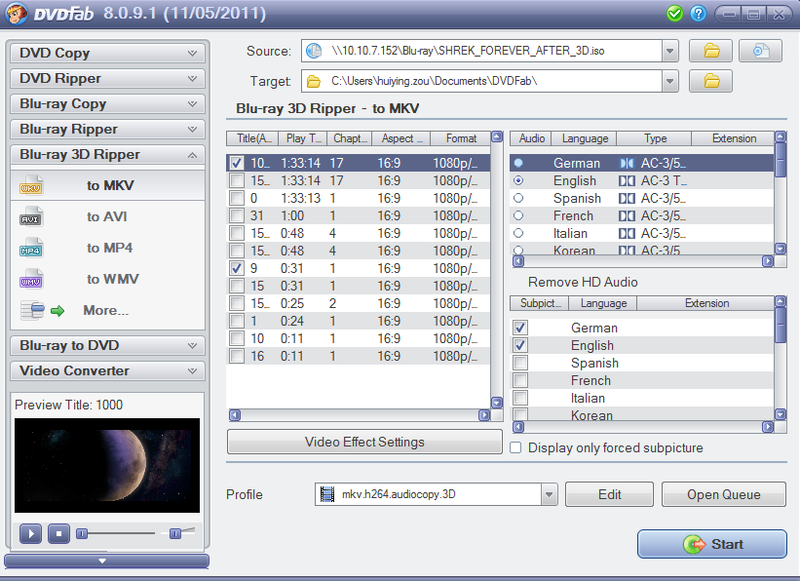 For more information about DVDFab Blu-ray 3D Ripper, please visit www.dvdfab.com/blu-ray-3d-ripper.htm.